The Toyota Yaris is powered by a 1.5l 4-cylinder, offering solid construction, good handling, and a relatively spacious interior for up to five passengers. Introduced as an all-new model for 2007, the Toyota Yaris offers solid construction, good handling, and a relatively spacious interior. All models include standard air conditioning. Side-impact and side-curtian airbags are optional, as is a host of other equipment features. The 2007 Toyota Yaris Sedan is powered by a 1.5-liter Inline-4 with 106 hp. 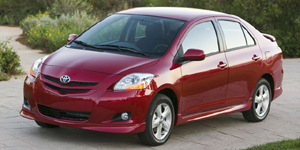 The 2007 Toyota Yaris 3-Door Liftback is powered by a 1.5-liter Inline-4 with 106 hp. Find the used Toyota Yaris of your choice from a dealer in your area. Search our used car listings now.